A new amplifier from Cyrus that is based on some of the things learned in the development of their flagship mono amps as well as their investigation into digital power amps. Stereo 200 is a high performance power amplifier incorporating a new and unique Cyrus topology that combines the benefits of high efficiency and lower heat generation from a digital output stage, with our highly refined analogue power supply design. Delivering a herculean 2 x 200 watts into 6 Ω from the single ½ width Cyrus die-cast aluminium chassis, this amplifier is intended to fit in the range between the X Power and the Mono X 200 Signature. A new 200 watts per channel stereo power amplifier using a unique hybrid design, this high quality power amp provides immense power from a very compact chassis. An ideal match with Stream XP orPre DAC models. 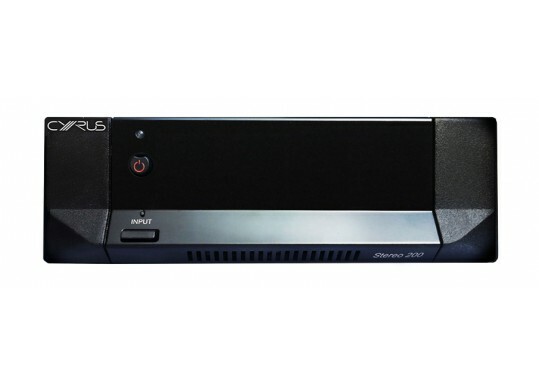 Cyrus’ new Stereo 200 power amplifier is the first hybrid power amplifier to be launched from this new platform. By "hybrid" we mean it incorporates a traditional Cyrus power supply design with a low noise toroidal transformer, married with a new, high power, class D output device. This combination provides enormous continuous power and superb dynamics. The unit offers fully balanced XLR inputs that offer the best noise immunity when connecting to a unit with a balanced output. Standard RCA type connectors are also available for preamps that only have unbalanced outputs. The unit has gold binding post connectors suitable for bare wires, spade terminals or 4mm post connectors. 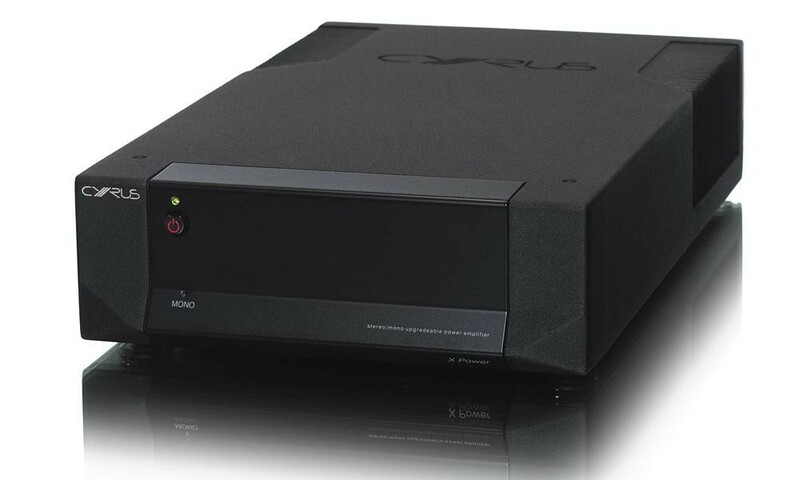 Using the Cyrus Class D hybrid technology we are able to produce a high powered stereo amplifier in a small box without any cooling issues or compromises in the audio quality. This high efficiency design ensures nearly all the power supplies energy is used for the amplifier output rather than wasted as heat. Using this technology (even with the large power outputs) there is no need for cooling fans in the box. Efficiency and damping factor are further improved by the unit harvesting the energy used to stop the speaker cone moving and placing it back into its power supply reservoir. The RCA input is also available as an unbalanced RCA output for connection to another power amplifier. The XLR input is changed from balanced to unbalanced and when selected is also available on the chain output RCA connectors. The amplifier can be switched off and on from any device emitting a 12V trigger output. The input is on a 3.5mm jack socket. Each time the amplifier is powered up, the SID (Loudspeaker Impedance Detection System) interrogates the speaker load and adjusts the amplifier to provide correctly balanced and smooth high frequencies. This has proved to be a highly successful method of accurately aligning the class D output devices. When the unit is mains cycled an assessment is made of the loudspeaker load at high frequencies. There is an adjustment made to the frequency response of the amplifier output to correct for differences when driving different load impedances. From full standby the unit can be made to switch on with any signal input above -55dB. After being on if there is no signal above -55dB into the unit for 10 minutes the unit will go back into standby. The class D output filter uses a ferrite shielded coil with oxygen free copper and polypropylene metal foil capacitors in order to achieve the best possible distortion figures, damping factor and sonic performance. This section is a key fine-tuning point for the sonic signature of the amplifier. The unit constantly monitors the circuit for errors in supply voltages, DC offset from the speaker outputs and also over current short circuit. The circuit will even detect a short circuited output without any applied audio signal. The class D carrier frequency has been modulated at sub sonic frequencies in order to remove any possibility of quantization jitter. The two amplifiers also have linked carriers in order to eliminate any beating or crosstalk artefacts between the two amplifiers. Stereo 200 has extensive filtering on the mains power supply, providing the greatest possible immunity from external factors affecting the audio performance. The microcontroller and all other support electronics are powered form a totally separate power supply, heavily filtered to minimise the noise floor. All low level audio signal carrying components are powered from 4 independently regulated supplies. The high current supply is also individually fused and decoupled for the left and right channels, minimizing crosstalk. Microphony - The negative physical impact of vibration on an electrical component. This can be microphonic and caused by the environment or just the music playing in the room transferring energy into a poorly made lightweight chassis, and thereby into the capacitors and other susceptible components. Unlike valves where taping the glass component was directly audible, microphonic influence on solid state electronics has an effect more like blurring the sound. The Cyrus chassis is inverted allowing Cyrus to ‘hang’ the transformer inside the chassis helping to improve further the inherent ‘deadness’ of the cast chassis. Electromechanical - Electrical components will inductively couples their electromechanical field effects into the ferrous steels used in all low cost chassis. The chassis will then inductively influence all the other components in the chassis. Cyrus’ choice of aluminium for our custom die-cast chassis means our circuits are unaffected by inductive loops and therefore the high performance, close tolerance components we specify perform optimally in a quieter environment. The pressure die-cast aluminium chassis is sometimes mistaken as a marketing issue. In fact our investment in an expensive tool to die-cast this non-ferrous, low resonance enclosure was made to provide the perfect mechanical enclosure, enabling consumers to hear and appreciate the audiophile grade close tolerance components we use. Despite the high power specification of Stereo 200, the amplifier consumes less than 0.5 watt, power consumption, in standby state. Full RS232 control provided to allow a suite of Stereo 200 to be connected together. 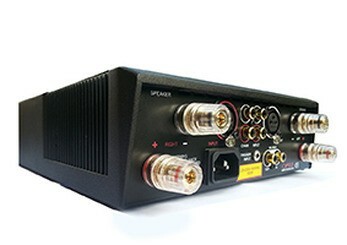 As with all of our products, the Stereo 200 can be connected to our other systems via our unique MC-BUS connectivity. 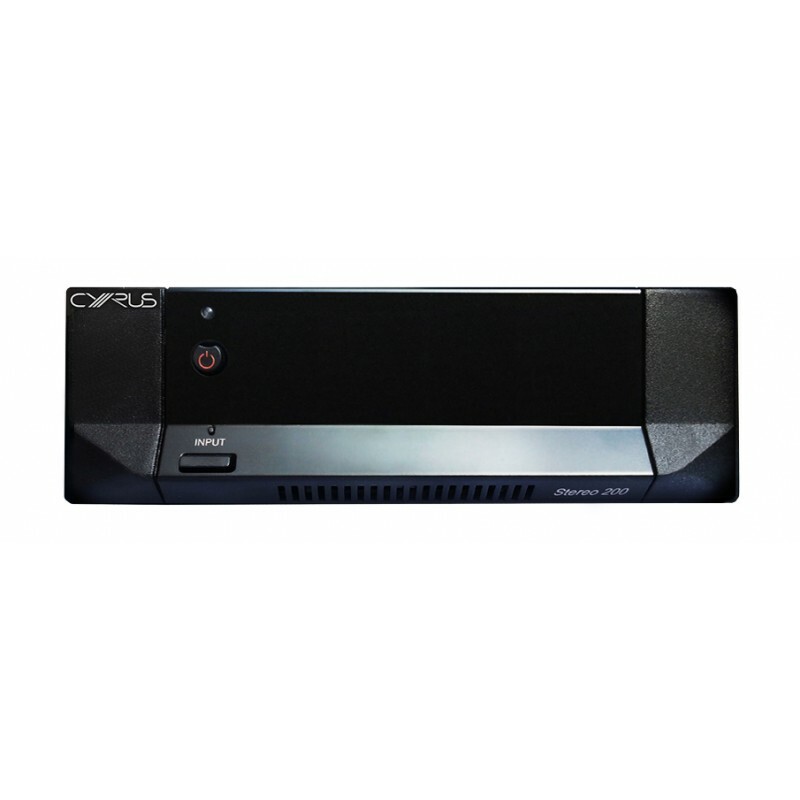 Your Inquiry about Cyrus Stereo 200 Power amp is Successfully Submitted.